No one can with accuracy predict what fate has in store for them so there is no reason to suppose that Rosemary Clooney had any idea when she embarked on her long professional career as an entertainer what awaited her. After entering amateur events at High School in Cincinnati she worked on local radio where she appeared with her sister in duets. Whilst appearing with Barney Rapps’s band the two girls were heard by bandleader Tony Pastor who took them on the road for two years. Pastor’s band was nationally prominent and so Rosemary was heard on the radio and in the band’s recordings. She soon went solo and so the first of the phase of her life ended. The Second started when Pastor’s record company, Columbia, presented her as a solo artist in 1949 when the popularity of dance bands was just beginning to fade. She slowly made her way into the next two phases of her life successfully but not without problems in her personal life, but let’s not dwell on those. Let’s just listen to the girl with a voice once referred to as "like mothers’ milk." It was in September 1947 that Rosemary recorded "Grieving For You" with Tony Pastor. I was impressed with how she sung this, to me, unknown number. I didn’t feel she needed to make any effort to tell you how she was grieving. It was obvious. Even then her voice reacted instinctively to each word. My only criticism is the orchestra. It comes in too loud when it is necessary for Rosemary to pause, although I admit they reduced their volume when she is singing. I like the song, though, and think Rosemary sings it with great sensitivity and you felt she was feeling what she was singing about. Her next recording is from March 1949 also with Tony Pastor. It’s that lovely song "When You’re In Love", an adaptation of the melody "La Golondrina". Rosemary sings quietly and with hardly any effort but plenty of feeling. Here again her voice responds to how she herself might feel when in love. Her voice also has the right intonation and you know it’s her natural way of knowing what is needed and can adjust to any type of song. The orchestra accompanies in just the right tempo making this recording of an old song very enjoyable indeed. With Hugo Winterhalter and his orchestra and vocal group we also have "The Kid’s A Dreamer" from a month later. Once again in no hurry, Rosemary seems to make you want to listen to her, which says it all I think. The orchestra and vocal group support is perfect and together they make this number into something well worth listening to. I wondered what I was going to hear when I saw the title of her next recording in December 1949. This is "Why Don’t You Haul Off And Love Me", again with Hugo Winterhalter and his orchestra. I needn’t have worried. I should have known that to someone so talented there’s clearly no melody she can’t adjust her voice to. The liner notes call this a "Rural Song". Well it’s certainly a lively and bold number with the vocal group singing in contrasting harmony. The result is certainly a vivacious gem and I think you’ll enjoy it as much as I did. Just don’t be put off by the title. Rosemary next recorded in March 1950 and it was that old favourite "Me And My Teddy Bear" with Percy Faith and his Orchestra. In fact this in one of several children’s songs she recorded that have survived over the years and can still be heard even today. After all who doesn’t like cuddly Teddy Bears? I love them even now and in her customary versatile way Rosemary sings this song simply and clearly to both children and to adults. I hope this song goes on. I’m sure it will. Rosemary teamed up with a young Guy Mitchell in October 1950 to record Irving Berlin’s "You’re in Love" from Irving Berlin’s "Call Me Madam". As this is one of my long time favourites I was delighted to hear Rosemary sing it with another great favourite. To hear these two delightful voices singing this great duet was a great pleasure and real treat. A simple title but a song beautifully sung is "Beautiful Brown Eyes" recorded in January 1951 with Mitch Miller. Rosemary sings this with such sensitivity that you can feel her voice tugging at your heartstrings about someone who will never love blue eyes again. Simple words simply sung but it all comes over as something particularly tender. An excellent backing group joins her here and both they and the orchestra softly blend in with Rosemary superbly. I think you will appreciate this recording as I did. It’s a pity it hasn’t survived as well as other of her recordings but then this CD might change all that. At the same time she recorded "Shot Gun Boogie" with Mitch Miller. After listening to the previous song I was disappointed when I heard this immediately after. Certainly I admire how Rosemary can adapt to any kind of song but I didn’t really take to hearing her sing in this particular style. I was relieved when I next heard her sing "Mixed Emotions" made in the February of 1951 with Percy Faith. This is a ballad of someone who feels differently when a certain person isn’t with her. Which is why the song is all about emotions. Rosemary sings with great feeling as always, and you are aware she means every word. Again with Percy Faith, Rosemary sings four songs from Walt Disney’s version of "Alice in Wonderland’, all recorded April 1951. In this order she sings "Alice In Wonderland", "The Unbirthday Song", "I’m late" and "All in a Golden Afternoon". I really can’t praise highly enough how she delivers these distinctive songs, or in some cases sings and talks them. She does it all so beautifully with every word clear and eloquently expressed. There is another successful venture into the children’s song genre that Rosemary seemed to love so much in "Suzy Snowflake" recorded in May 1951. This is very much a children’s' song although when you hear it you will understand how cleverly both Clooney and the orchestra compel you to listen. Simple words about playing in the snow. You hear jingles and other sweet sounds and Rosemary in a gentle tells you all about Suzy, her voice ideally reacting to how a small child would like to hear this. I found it a delight although I do wonder if today’s children would react to it in the same way as children did in 1951. In June 1951 Rosemary made one of her best known and best loved records, "Come On-a My House". This was popular from the start and you can still hear it on the radio to this day. Rosemary is as usual able to adapt herself to the type of number she sang and made that style her own. This is Rosemary in "ethnic" mode too and she seems as comfortable with this as any. The words don’t really matter here. The song just swings along. No wonder it has remained so popular. In the same mood what a delightful chirpy song "I Wish I Wuz " is. In fact this was recorded in August 1951 with the same team as "My House". It’s a simple, short, musical monologue type of song, someone telling you of the many things she would like to be in life. Perhaps they are silly and absurd things, but I’m sure it will bring a smile to your face and if a song does that it’s doing something right. Right through this CD the different styles of song Rosemary sings shows again and again what a versatile artiste she was. "Half as Much" from August 1951, again with Percy Faith, is another "Rural" song and one I have always liked. I admire the slight element of accusation in her voice as she sings this, proving once again how she can get to the essence of the lyrics and make us hear them. Another very catchy number indeed was her next recording with Percy Faith from November 1951, "Be my Life’s Companion". You will never grow old, she tells us, and what a marvellous thought that is for anyone to keep in mind. I had not heard this before but I liked it. I must say that the title of the next recording she made, "Botch-a-Me", had me baffled. It was recorded in April 1952 and seeing that she was accompanied by a harpsichord, two guitars and drums I was intrigued as to the kind of song I would hear. I liked it although I can’t say I understood a word of what she was singing about. Once again I admire how Clooney can adapt her voice to whatever genre she is in and excel. In that same month she recorded the more familiar "Who Kissed Me Last Night?" with Percy Faith. To hear her sing this after the previous number it’s hard to imagine you are listening to the same voice. This is a real ballad and Rosemary sings it clearly and concisely and tells you she is anxiously asking the question who the stranger was who kissed her last night. Just an ordinary number, but like all her others of this particular genre easy to listen to. However, with the same accompanists as in "Botch-a-Me" she also made "On The First Warm Day" that month. What a happy song, and Rosemary sings it so well you are left in no doubt as to what she hopes to happen. I loved her other recording on this disc with the same forces from that month also, the familiar "Too Old To Cut The Mustard" and I also smiled when I noticed she was singing a duet with none other than Marlene Dietrich. Another dialect song this and superbly sung as a duet and I’m sure you too will like it. Finally from these April 1952 recordings it’s back to Percy Faith for the great "Blues In The Night" where Clooney shows how she can sing a pure "torch" song with the best. This one is a great standard but I doubt it has ever been sang as well as this. More great versatility. With Harry James and the warm, mellow sound of his trumpet and orchestra Rosemary recorded "You’ll Never Know" in Hollywood in 1952. I’m sure most people are familiar with this but Rosemary in her usual way adds something extra, and by doing do turns this popular song into a serious ballad. By now I began to wonder if Rosemary was at this stage singing more serious ballads as the next recording she made was "If I Had A Penny" with Percy Faith. She emotionally sings that she would be a millionaire if she had a penny every time she cried for someone. Lovely words. Clooney sings this so poignantly that it really catches at the heartstrings, but then that is Rosemary’s natural talent for interpretation. Even if you’re unmoved by songs of this nature I’m sure you will enjoy listening to her singing in her charismatic way here. However in the next song I realised I had been wrong thinking she might have been favouring more serious songs. In Hollywood in December 1952 she recorded "Haven’t Got A Worry" with Paul Weston and his orchestra. This is from the Livingston and Evans score "The Stars Are Singing’ and Clooney tells you how she hasn’t got a worry over anything. The last song is "The Night Before Christmas", recorded in Hollywood in June 1952 with Carl Cotner and orchestra. Gene Autry joins her and they sing so well together. There is no doubting from the orchestra that this is indeed a Christmas number. I think I could say this ended the "third phase" of Rosemary Clooney’s great career in which she performed with many well-known stars of stage and screen. This disc contains only a few of her many hits. However, by the end of 1952 it is noticeable that her voice has matured, although it doesn’t affect that smooth, velvety tone. Her marriage in 1953 to Jose Ferrer inhibited her singing career somewhat as they had five children in five years. By 1968 she was practically retired, addicted to prescription drugs and separated from Ferrer. Then her old friend Bing Crosby came to her rescue and so started the `fourth phase’ of her long career. 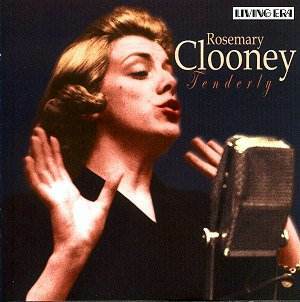 I do highly recommend this disk as Rosemary Clooney sings songs that will suit everybody. Her admirers will want it, and I am sure it will win a few more. So thanks to Living Era for their usual excellent job in providing such clear transfers and more thoroughly enjoyable listening.